Ronald Reagan (1911-2004) was 40th president of the United States and one of the most significant leaders of the Cold War. Born above a store in Illinois in 1911, Reagan was raised in modest middle-class surroundings by his Christian mother and salesman father. In his youth Reagan was a moderately successful student who earned some local fame as a volunteer lifesaver, pulling floundering swimmers out of the Rock River. 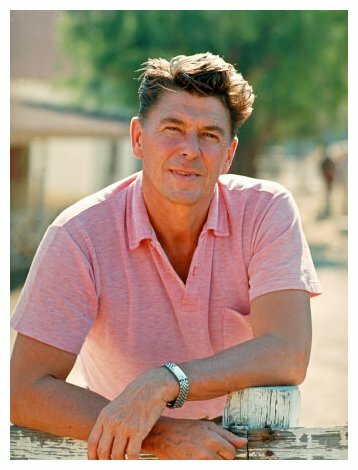 Reagan attended a Christian college in Eureka, Illinois, graduating in economics while participating in football, swimming, drama and student politics. Harbouring ambitions of stardom, in the mid-1930s he moved to Hollywood, California. Reagan obtained his first movie role in 1937 and by the outbreak of World War II he had appeared in 15 films. He enlisted in the Army Reserve in 1937, however, poor eyesight excluded him from active service. Instead, Reagan spent most of the war working in recruiting, advertising war bonds and entertaining troops. In 1945 he returned to the movie business, appearing in more than 50 cinematic and television releases. By his retirement from Hollywood in the mid-1960s, Reagan was well known by the American public, though his acting career never reached significant heights. Reagan’s first interest in politics was as a Democrat (during the 1930s he was an avid supporter of Franklin Roosevelt and his New Deal policy). Reagan was also involved in the Screen Actors Guild, serving as its president from 1947. Devoutly religious and anti-communist, Reagan actively supported the House Committee on Un-American Activities (HUAC) hearings. He reportedly supplied the Federal Bureau of Investigation (FBI) and congressional investigators with the names of fellow actors he suspected of communist sympathies. In the 1950s Reagan moved away from the Democrats and embraced the more conservative Republican Party. He opposed some civil rights legislation while arguing that governments should be doing less, not more, for ordinary Americans. Reagan’s public profile made him an ideal candidate for political office. In October 1964 he boosted his national profile with a powerful address in support of Republican presidential candidate Barry Goldwater. In 1966 he accepted the Republican nomination for the governorship of California. 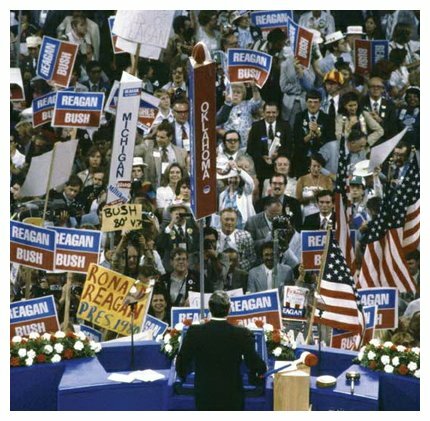 After promising to “send welfare bums back to work” and to deal with anti-Vietnam War protestors in colleges, Reagan was comfortably elected. Reagan’s governorship in California was marked by reductions in government spending, as well as some repressive measures against public unrest. He had no tolerance for protests or civil disobedience, particularly anti-Vietnam War demonstrations. As governor Reagan once ordered police and National Guard troops into Berkeley to deal with troublesome students; one man was killed and more than 120 hospitalised after police used shotguns, tear gas and batons. Reagan was a vocal supporter of president Richard Nixon’s Vietnam policies, at a time when public support for the war had plummeted. Reagan effectively legalised abortion in California by signing a bill permitting therapeutic terminations; he later claimed that he was opposed to abortion and had not fully understood the bill. During his two terms as governor Reagan also campaigned to revive the death penalty in California, however, he was thwarted by the state’s legislature and courts. Reagan stepped down from the governorship in 1975 to prepare for a tilt at the presidency. He failed to win the Republican Party’s nomination in 1976 but succeeded four years later, when he ran against the incumbent president, Jimmy Carter. Reagan’s campaign made much of the stagnating US economy and Carter’s alleged foreign policy failures. Reagan won the November 1980 election comfortably; at age 69 he was the oldest man to win the presidency. Four months later he survived an assassination attempt after being shot in the lung outside a Washington hotel. Reagan’s economic program focused on reducing taxes and cutting government spending. While his policies produced reductions in inflation and unemployment, they also made substantial cuts to medical aid, social security, education and environmental programs. Depending on one’s political perspective, the ‘Reaganomics’ of the 1980s was either a period of economic recovery or a time of social stagnation when little was done to assist the poor and the working classes. Reagan, the United States’ most anti-communist president, set about reigniting the Cold War after a decade of détente. In his public speeches and press conferences Reagan regularly criticised, antagonised – and even threatened – communist governments and leaders. He described the Soviet bloc as an “evil empire” whose “last pages even now are being written”. American Cold War policies of the 1950s had aimed at containing global communism – but Reagan wanted to roll back communism in Asia, Africa, South and Central America. He increased America’s missile and bomber capabilities; initiated research into the Strategic Defence Initiative (or ‘Star Wars’) program; and extended financial aid and military equipment to regimes fighting against communism. The US also placed diplomatic and economic pressure on the USSR, by cutting the trade agreements and deals forged during Détente. The showpiece of Reagan’s campaign against communism came in Berlin in June 1987, when he challenged Soviet leader Mikhail Gorbachev to “tear down this wall”. Two years later the wall between East and West Berlin came tumbling down, as Reagan had demanded. After serving two terms as president Reagan retired from politics in 1989, the presidency passing to George Bush Senior. Reagan was diagnosed with Alzheimer’s Disease five years later. He lived out his final years in his California home, recognising and remembering only a handful of people. When Reagan died in June 2004 more than 100,000 Americans traipsed passed his coffin as it lay in state. He remains one of the most popular US presidents in history – and is considered by many, rightly or not, to be one of its greatest. A good deal of this popularity is derived from Reagan’s pivotal leadership during the Cold War which, according to many, weakened the Iron Curtain and hastened the demise of the Soviet Union. Historians are more divided about Reagan’s impact, some suggesting that internal problems in the Soviet Union were equally or more responsible for its demise than any of Reagan’s actions or policies. 1. 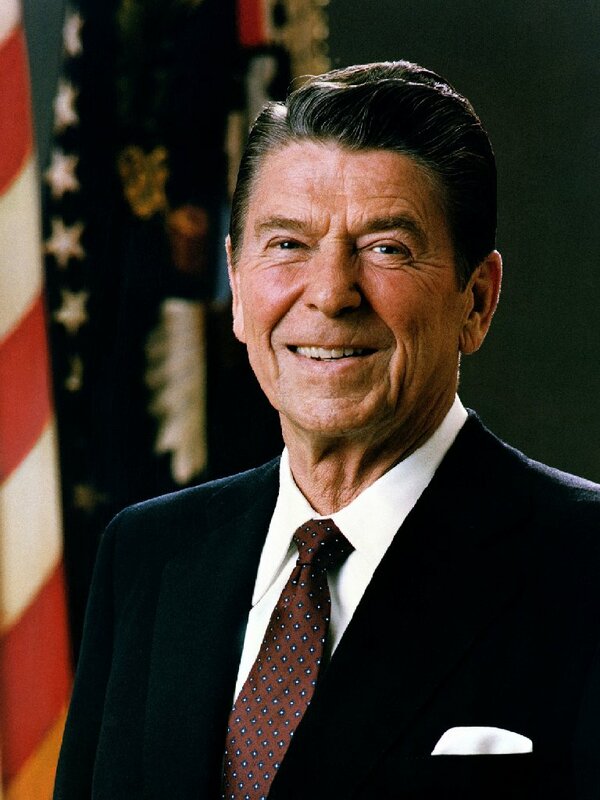 Ronald Reagan was a popular Hollywood film actor who transitioned into politics and eventually became the 40th president of the United States in 1980. 2. 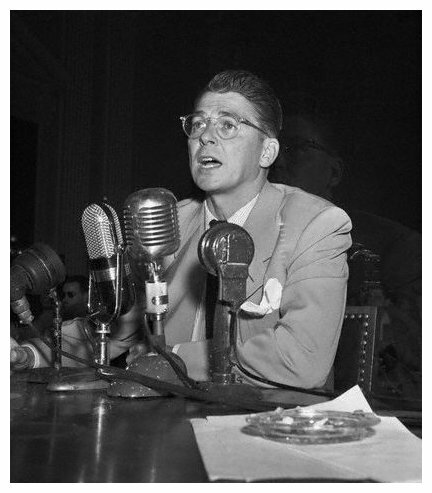 Initially a Democrat, Reagan became more conservative in the 1950s, joining the Republicans and working against alleged communists in the film industry. 3. In 1966 Reagan became governor of California, where he took a strong stand against government spending, crime and anti-war protestors in the state’s colleges. 4. After becoming president Reagan, who was more anti-communist than his predecessors, ended Détente and reignited the Cold War by increasing military spending. 5. Reagan’s support for nationalist movements around the world, his belligerent rhetoric and his determination to ‘rollback’ communism is viewed by many as a critical factor in the demise of the Soviet Union and the end of the Cold War. J. Llewellyn et al, “Ronald Reagan”, Alpha History, accessed [today’s date], https://alphahistory.com/coldwar/ronald-reagan/.